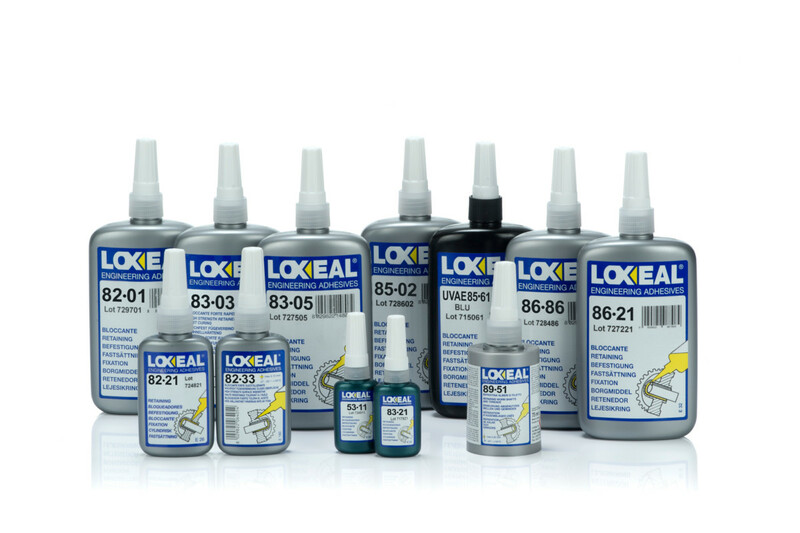 Retaining Anaerobic Adhesives | Loxeal S.r.l. Retaining anaerobic Loxeal adhesives lock and fit bushes, bearings, sleeves, pin hubs, pulleys, gears and other cylindrical components and increase the load carrying capacity. It provides 100% surface-to-surface contact allowing to use smaller parts, different and less expensive materials. Medium strength anaerobic adhesive for retaining of bearings, liners, bushes, keys and splines. Highly resistant to heat, corrosion, vibrations, water, gases, oils, hydrocarand many chemicals. High strength anaerobic adhesive for locking and sealing threads, and retaining of cylindrical components. High strength anaerobic adhesive for retaining of close fitted parts, shafts, bushes, pulleys, rotors. High strength anaerobic adhesive for metals, highly resistant to oily surfaces. To be used on cylindrical fitting parts, either for slip fitted and for press fitting assemblies. Retaining compound for rotors, gears, bushes, bearings and pin hubs. Highly resistant to temperature, thermal shocks, vibrations, oils and hydrocarbons, refrigerants and many chemicals. Fast curing high strength anaerobic adhesive for locking and sealing threads and retaining of cylindrical components. Highly resistant to heat, corrosion, vibrations, water, gases, oils, hydrocarbons, and many chemicals. Approved for Gas (Gaz de France). Drinking water Certification. France: according to Eurofin Expertises Environmentales texts. (Dossier n° 14 CLP NY 005) product is in compliance with white lists – Ministère chargé de la santé DGS/VS4 n° 99/217 du 12 avril 1999 et DGS/VS4 n° 2000/232 du 27 avril 2000 (ACS). Fast curing high strength anaerobic adhesive for locking and sealing threads, and retaining of cylindrical components. Highly resistant to heat, corrosion, vibrations, water, gases, oils, hydrocarbons and many chemicals. Approved as thread sealant with gaseous oxygen up to 20 bar at + 60°C (BAM Ref N° II.1/46 363). Fast curing high temperature resistant. High strength anaerobic adhesive for locking and sealing threaded connections and retaining of cylindrical parts. Medium thixotropic effect, allows larger machining tolerances. Highly resistant to corrosion, vibrations, water, gases, oils, hydrocarand many chemicals. Fast curing high strength anaerobic adhesive for locking and sealing threads, and retaining of cylindrical parts. It allows larger machining tolerances. Highly resistant to heat, corrosion, vibrations, water, gases, oils, hydrocarand many chemicals. Anaerobic/UV high strength retainer for metal cylindrical assemblies. Curing is effected in seconds by UV light and in few minutes by anaerobic polymerisation. The fast cure avoids heavy press fits. The cured adhesive is a thermo set plastic suitable for exposure to most solvents and it stands temperatures up to +150°C. Very fast curing, high strength anaerobic adhesive for locking threads and retaining od cylindrical components. It allows large machining tolerances. Highly resistant to corrosion, vibrations, many chemicals and ageing. Very high temperature (+ 230°C) resistant, high strength anaerobic adhesive for locking and sealing thread connections and fitted parts. High viscosity and thixotropic effect allow larger tolerances. DIN DVGW approved thread sealant for gas (according to DIN EN 751-1 Reg. Nr. NG – 5146BQ0496). A high viscosity gap filling silver paste used between machinery parts to repair worn areas and restore correct fits. It repairs worn shaft and housing, bearing spinouts, wallowed keyways and splines, threaded parts. Highly resistant to heat, vibrations, corrosion, water, gas, oil hydrocarbons many chemicals.